Author(s): Hilde Nybom, Balsgård, Department of Plant Breeding, Swedish University of Agricultural Sciences, Fjälkestadsvägen 459, SE29194 Kristianstad, Sweden., Sweden	Gun Werlemark. Systematics and Genetics: Medicinal effects of rosehips are attributed mainly to dogroses, i.e. species in Rosa sect. Caninae. These are mostly pentaploid and have a unique meiosis with asymmetrical chromosome distribution. Offspring in reciprocal crosses differ widely since seedlings resemble the seed parent more than the pollen parent. Chemical Contents: Flesh (shells) of rosehips from dogroses contain high levels of antioxidants, mainly polyphenols and ascorbic acid, as well as carotenoids and vitamins B and E. The seeds are rich in polyunsaturated fatty acids and are used for skin treatment and cosmetics. Both shells and seeds, separately or together, are used for health-promoting food and food additives. Medicinal Effects: The most well-documented studies concern the positive effects on inflammatory processes, especially in patients suffering from osteoarthritis. The exact medicinal role of different rosehip compounds have not been investigated in detail, and the relative importance of fruit flesh versus seed is also not yet determined. Plant Production and Breeding: Rosehips are mainly harvested by hand from wild or naturalized dogrose bushes. Once the key compounds have been identified, commercial output of rosehips with predictable quality would be facilitated by careful optimization of plant material, cultivation conditions, and post-harvest and processing procedures. Some cultivars have been bred in Europe but breeding goals have not been clearly defined and commercial production is limited. Modern genomic tools have improved breeding programs in many crops but polyploidy and the canina meiosis present considerable challenges for research and breeding in dogroses. Keywords: Antioxidant, functional food, medicinal plant, phytotherapy, plant breeding, plant taxonomy. Affiliation:Balsgård, Department of Plant Breeding, Swedish University of Agricultural Sciences, Fjälkestadsvägen 459, SE29194 Kristianstad, Sweden. Keywords:Antioxidant, functional food, medicinal plant, phytotherapy, plant breeding, plant taxonomy. 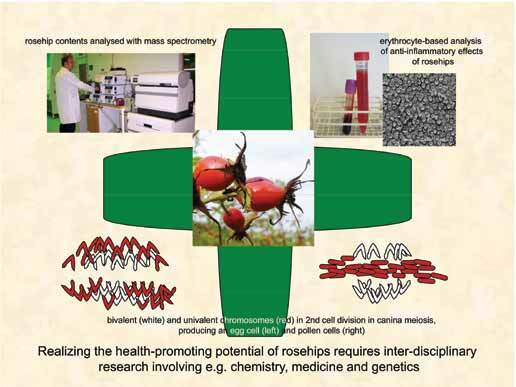 Abstract:Systematics and Genetics: Medicinal effects of rosehips are attributed mainly to dogroses, i.e. species in Rosa sect. Caninae. These are mostly pentaploid and have a unique meiosis with asymmetrical chromosome distribution. Offspring in reciprocal crosses differ widely since seedlings resemble the seed parent more than the pollen parent.